MISC is a maritime logistics company domiciled in Malaysia. The company organises itself into four segments: petroleum, liquefied natural gas, offshore, and heavy engineering. The petroleum segment, which contributes the largest portion of revenue, transports crude oil, petroleum products, and chemicals by sea. Liquefied natural gas, the next most significant segment, transports liquefied natural gas through its fleet of shipping vessels, and operates floating storage units. The offshore segment operates and maintains offshore floating terminals. The heavy engineering segment provides offshore and onshore construction and maintenance services. The company derives approximately half its revenue domestically and half its revenue from the Americas. ezobear Winter + "Coal to Gas" have caused the LNG spot price shooting up to the sky since Oct, as well as the LNG Freight spot price. windcloud Misc TP: 7.40 to 7.60 level. - LNG vessel charter rate is improving, previous months charter rate is about USD40/day, and in December it had risen up to USD52/day, this is about 30% increased in chartered rate, and this may even can drive up to USD60/day, stronger demand in natural gas/LNG in Asia market and recent hike in natural gas had boosted the shipping market which has been slowdown in this couple years. - Winter season has boosted the demand of petroleum chartered vessels and the rate and demand is improving and 2018 will also see the market recover for the petroleum chartered vessel. - MHE bottomline is improving and this in turn will help to improve MISC bottomline. With the recovering of oil & gas markets in following years, chartered rate and demand for vessels will be improved, besides, increased in newbuilds will be offset against demolition of old age vessels and market rate will be improved for those newbuild in compliance for environmental regulation. With 1MDB loan finally settled to IPIC and recent MYR strengthened and international reserves being improved, foreign funds will continue to buy in bursa stocks. mancingbursa ini lousy kaunter kah? ribort_kok Monitor..once the time comes..buy..
HalimSaadAnakHaram MISC is run by corrupt & bloody clueless top management...expect SPRM to put these guys in jail soon...clueless top management who cant find business except from petronas only...Sack them all!! Jeffreyteck IBs must be very happy with EPF, buy...sell...buy...sell. wish EPF internal controls is sound in order to minimize brokerage charges. rojakmee Pakatan harapan goverment must look into EPF, something seriously not right EPF, KWAP,PNB buying and selling sometime on same day,hidden agenda at work. IBs must be very happy with EPF, buy...sell...buy...sell. wish EPF internal controls is sound in order to minimize brokerage charges. 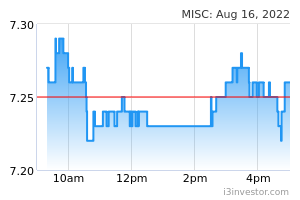 Raghu Nath Sharma Why is misc dropping today? Alex2012 Why is misc up today? wilsonchan87 finally get new contract of FSO for 16 years with an estimated contract value of USD 441 million. lochangyong sudden bump today ? +0.17 ? davidkkw79 Congrat our LGE is the top richest MP in Malaysia, and welcome he continue to become major shareholders of MISC CONTINUE TO LEAD MISC TO HOLLAND. Joanne Tan Hi anyone can tell me why misc suddenly increase 0.16? 5354_ Last year QR out 3rd Nov why this year late?